Peter P led the way with our first stop being Crystal Brook to visit the local bakery for some much-needed coffee and morning tea. The two-ways allowed for some banter and general chitchat, which created a relaxed comfortable atmosphere. Second stop was at Port Augusta to fuel up and again fill our bellies with lunch. We set off again and headed to Pildappa Rock. We arrived at around 4pm and found a spot to set up for the night. After unpacking, we then went for a walk to the top of the Rock. After dinner, the team set up the campfire and we all sat around discussing our day’s events. It was an extremely pleasant start to our first day with everybody getting to know each other and embracing each other’s styles and characters. For those that have never seen ‘Pildappa Rock’, you are missing out big time. 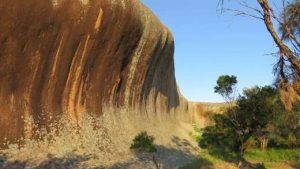 The rock is a unique, pink inselberg located 15km northeast of Minnipa and looks very similar to the ‘wave rock’ in WA. It’s absolutely stunning at sunset and sunrise! Maria D loved it so much she woke up early the next day to walk around it – twice! 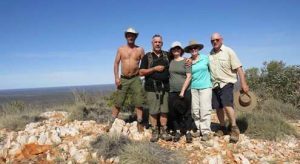 After a leisurely breakfast on a beautiful morning, Jim led us out from Pildappa Rock to Ceduna to fuel up and have some lunch, and then we gathered at a service station to continue to the start of the track. After entering the Yellabinna Park we lowered our tyre pressures to suit the sandy track. The first section of the track was fairly easy without too many large sand dunes. 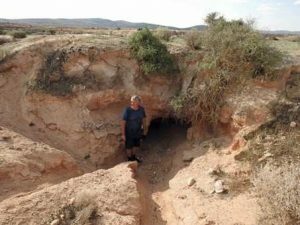 On the way, Peter led the group into the Rock Holes, a short distance off the main track. 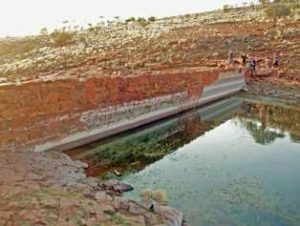 Goog thought he might have been the first white man to see them, and there was only a small amount of green water in the holes. There were only a few birds, with Martins skimming the surface for a drink. 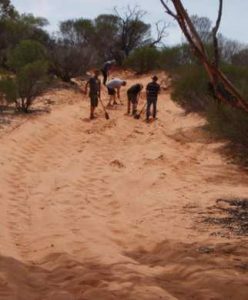 Back to the track, our next stop was at the Memorials to John “Goog” Denton and his son Martin “Dinger” Denton who, with the rest of the family, cut the track through the dunes. The trees near the memorials had quite a large number of coins jammed into cracks in the trees. A short drive to the lake, then set up camp and the long drop, light the camp fire and relax. Googs Track was named after Stanley, Gilbert, and John Denton, who built the Track, predominantly with his family. The name ‘Goog’, was Stanley’s nickname, for, as a young lad, he sold eggs for his mother. On Day Three, the group woke up to a beautiful warm and sunny morning on Googs Lake. 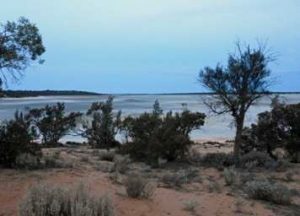 The plan was to circumnavigate Googs Lake, then hitch up our campers and head off to Mt Finke. We set off down a curly track and saw various wildlife and flora, ending up at the Lake’s edge. After a short break, we headed back to camp hitched up and set off for the next part of the adventure and we weren’t disappointed! The phrase, ‘How to get fit fast’ comes to mind when describing the rest of the day! The Track was in bad shape, with bad ruts and holes, and soft sand at the top of the hills. You couldn’t get enough momentum to clear the hill, especially if you towed a camper. Three of the group towed campers, Peter and Lynne, Jim and Lee, Steve and Maria. Greg, Maria, Peter, and Elaine only had their cars and swags, which, in hindsight, was a smart move. Countless hours was spent on ‘Track Maintenance’ with shovels in hand, in the hot sun. It was hard work! The men became quite expert at it, even in the heat. As we rounded the sandhill, the view was spectacular and soon we could see Mt Finke getting closer. 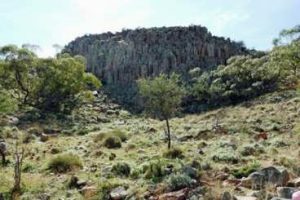 There were desert Poplars and various other flora and fauna, that Peter P made us aware of, having previously catalogued many native species. After lunch, more track maintenance and digging to get the max tracks under the wheels of the car, to get over the soft tops of the sandhills. Mt Finke was getting closer but not attainable that day, so the plan was to find a spot, off the road to setup camp for the night. That evening, around the campfire, stories of spilt flour and cutlery going ‘AWOL’ circulated. Things in the car and especially the campers were tossed around. That’s how rough the track had been! Many of us had sore muscles but we were more fit and more determined! After camping just off the Googs track the previous night, we awoke to a chilly morning with ice on the canvas. We left at 9 am heading towards Mt. Finke. Maria D went ahead for her obligatory morning walk. We were relieved when she was spotted further along the track. Before we could even start, track maintenance was necessary on the first dune. Peter P led the convoy admirably, communicating with us exact details of what lay ahead. The men only had to do some track maintenance twice today! 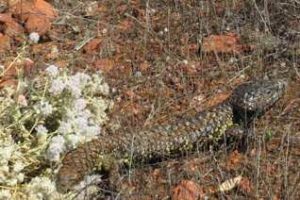 Numerous feral cat, dog, camel, echidna, lizard and goanna prints were evident along the track. At some stages, we thought it would take us days to reach Mt. 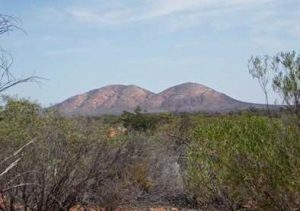 Finke as the mountain looked such a long way in the distance. It was obvious there hadn’t been much rain this winter as there were few wildflowers or birdlife about. 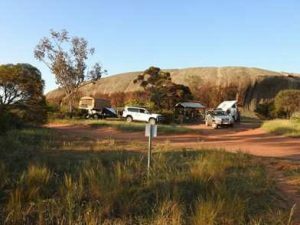 We arrived at Mt Finke campground at 12 noon after travelling 25 kms. 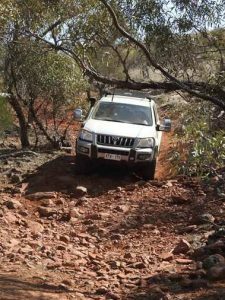 Some of us climbed Mt Finke, often following roo tracks for the ascent. A spectacular 360⁰ view greeted us at the top where we saw vast areas of vegetated sand dunes, a large salt lake and subtle changes in the flora. 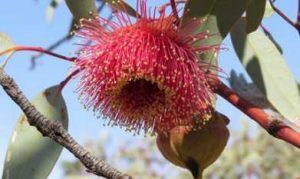 We were fortunate enough to see some beautiful Eucalyptus youngiana – Ooldea Mallee flowers on the climb. A wonderful night sitting around a campfire, having the campground to ourselves with a canopy of stars above. 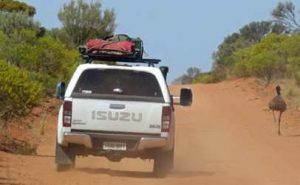 Another beautiful morning; Steve led us from camp on our last day on Googs track, a quite flat run back to the main track then North again for about 40km to the Tarcoola road at Malbooma. 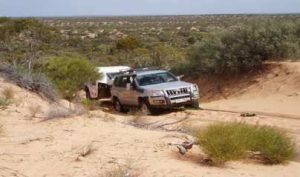 We still had to get out the shovels in this last section for a few of the really rough, long dunes but finally crossed the East West train line, pumped up our tyres, had lunch, then turned right to Tarcoola, almost a ghost town. On the way Greg and Maria had a close up and personal look at an Emu that decided to lead them into town, this continued for several hundred metres. 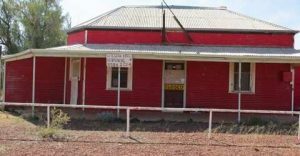 After a short exploration of Tarcoola we continued east crossing the train line several times to arrive at Kingoonya. We all woke up to another perfect day in paradise! Albeit some trains kept some of us awake during the night, not to mention the barking dog. Maria D was itching to get the day started so she used the opportunity to start walking to Mt Ive. Some 5km later the man of her so-called dreams picked her up and the team were off again. 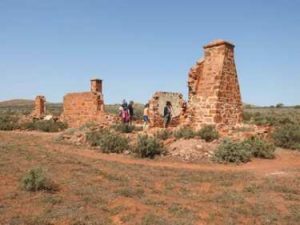 There was so much to see along the way, we stopped to look at old ruins, skull tanks and of course the contrast of scenery from one area to the next. 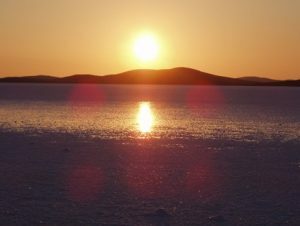 We finally arrived at Mt Ive Station, unpacked, and then set out again to visit Lake Gairdner to see the sunset which at this time of night was just stunning. On the way we stopped at Kath’s Castle look out and an embankment built in 1892. After a leisurely breakfast we all lined up to drive one of the tracks on Mt Ive called “The Flight Path” a 30km track around the Station tracks named after Graham Flight who created the track, stopping at features such as the lookout from which you get a stunning panoramic view of the station property, Peters Pillars a stand of Rhyolite columns (organ pipes), and steep ascents and descents through deep dry creek crossings. On the drive we had to wait for a pair of sleepy lizards to cross the track, stopped for lunch under a stand of trees and had to do a U turn when the leader missed a turn (the sign had fallen down). We also drove up to the top of Mt. Ive, a slow, rocky path with the occasional step up over larger rocks. The view from the top is spectacular with 360 degree views and when the sun shone, the silos at Kimba, 85km south, could just be seen. A trip out to the wombat holes finished the day. 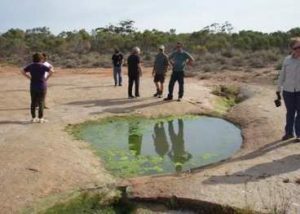 The wombat holes are HUGE, and many of them. On the way back to the Station, we stopped at the “submarine” for a group photo, then relaxed in the gazebo for a few drinks and nibbles. Last day of Goog’s Trip was again, a glorious, sunny and warm day. 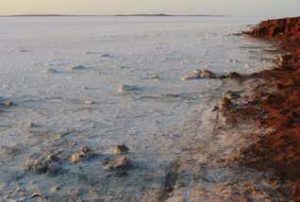 This emphasis on the weather is very relevant, when you consider that, at the beginning of the trip, the weather in Adelaide was cold and dreary, with rain predicted. This is the great thing about going on trips, as you can get away from the cold! The last leg was from Mt Ive to home. Even though it’s nice to come home, everyone was disappointed that the Trip had come to an end so soon, as the group had got along, so very well. 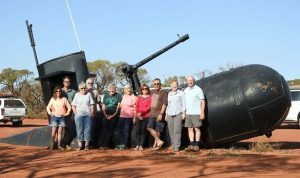 We had a group photo at the Mt Ives submarine, which was an old boiler; half sunk into the ground and then painted to look like a sub. 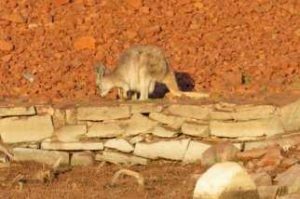 It was a long and dusty drive to the Iron Knob turnoff and we had to avoid many lizards and emus along the way. Steve unfortunately did not avoid one emu plucking some feathers, before it ran off into the scrub never to be sighted again. Finally we hit the bitumen at the Iron Knob turnoff and headed for Pt Augusta, for a lunch break, and a farewell to each other and then, home. A great trip; it was a pleasure to plan and lead a trip where the weather was fantastic, the group dynamic was really good, everyone melded well and all pitched in when we had to dig. The report and the pictures do not do the trip justice, the trip picture folder combined contains just under a thousand photographs and in the report we could only place a few. Mt Ive has many more attractions we did not have time to explore. Do we need another trip?